Come try out Rock Town’s Arkansas Rye Whiskey; a premium small batch rye whiskey distilled, aged and bottled at their distillery in Little Rock, Arkansas! Best enjoyed straight up, on the rocks, or in your favorite cocktail. 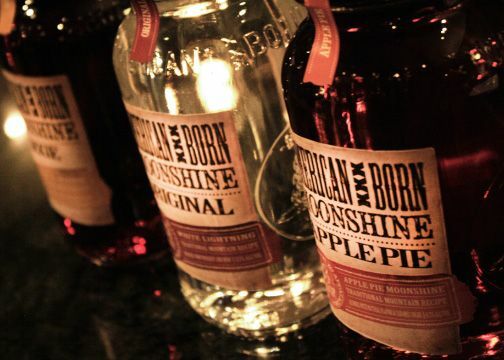 Now carrying American Born Moonshine from Windy Hill Spirits out of Nashville. Three distinct flavors – Original, Apple Pie and Dixie Sweet Tea – all made to pay homage to the past and to continue telling the story of the smooth side of a rough history. American Born is not a white whiskey by the modern definition. The addition of cane sugar adds nuances of flavor to the corn, which can taste kind of flabby and well, corny, without something to smooth out the finish of the drink. The resulting “cane and grain” spirit is called American Born Moonshine Original, a 103 proof product that can be sipped directly from the jar if you’re brave, or mixed with soda and/or lemonade or grapefruit juice if you’re not.